Horizontal ergometer providing excellent comfort during exercise, especially for those who suffer from back problems. Comfort model (C6) with adjustable COMFORT handlebar, facilitated "low" access, suitable for a user who prefers comfort. Comfort model (C8) with adjustable COMFORT handlebar, facilitated "low" access, suitable for a user who prefers comfort. Comfort model (C12) with adjustable ergonomic handlebar covered in faux leather, facilitated "low" access, suitable for a user who prefers maximum comfort. Professional ergometer equipped with a feedback braking system. Ideal for performing cardiological stress tests. Powered by the electrical network. Professional ergometer equipped with a feedback braking system. Ideal also for performing cardiological stress tests. Powered by the electrical network. Upright bicycle ergometer, Elite line, for rehabilitation. Electrical power supply system. 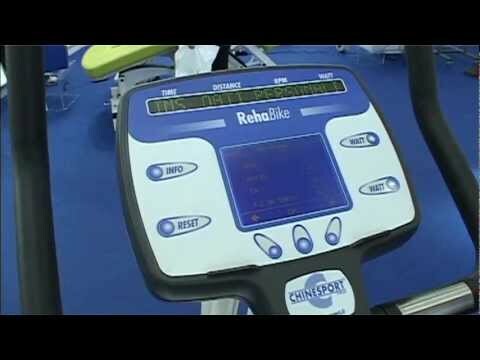 Horizontal cycle ergometer, Elite line, for rehabilitation. Electrical power supply system. Fixed wall ergometer for upper limbs. Adjustable into its constituent parts. Seat not provided. Mobile ergometer for upper limbs. Adjustable into its constituent parts and fitted with wheels for transport. “Magnetica” range easy-to-use rehabilitation cycle ergometer, provided with a console to display and set the basic parameters. The ergometers are electronically set and feature precise load control and height data accuracy. They comply with the high requirement laid down in DIN EN 957-1/5, class A, the higher precision class for home fitness, and are therefore especially suited therapeutic use, as well as for a stronger cardio-fitness workout.